If you’ve ever searched for alternative autism treatments, you’ve probably heard of the gluten free casein free diet (aka GFCF diet), which was first developed to help individuals with celiac disease. As the name indicates, the gluten free casein free diet is completely devoid of the proteins gluten (found in wheat, barley, and rye) and casein (found in milk and dairy products), both of which can cause irritation and inflammation of the gut lining in those who are intolerant or allergic. 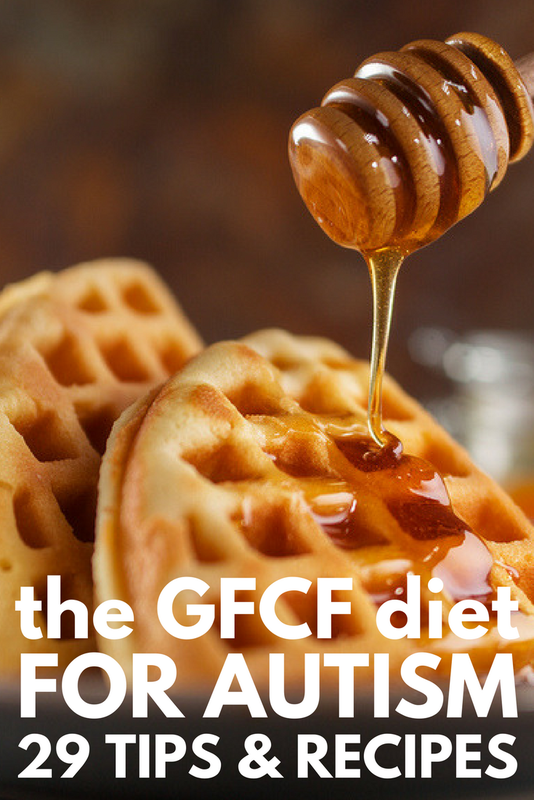 The theory behind the GFCF diet as it relates to autism is that the resulting inflammation caused by gluten and casein can affect the brain and cause/worsen symptoms of autism. Many parents report an improvement in behaviors such as hyperactivity, eye contact, meltdowns, and language skills as a result of the gluten free casein free diet, and others have gone as far as to claim their child(ren) have been completely cured of autism after adopting a GFCF lifestyle, but researchers aren’t as convinced. Additional studies are needed to fully evaluate the relationship between gluten and autism and the effectiveness of the GFCF diet as an alternative treatment for autism, but many parents still opt to try the diet, especially if their child also shows signs of gastrointestinal issues like constipation and/or diarrhea. Consult with a registered dietician. Children with autism tend to be restrictive eaters, and when you’re eliminating some (or all) of the things on the limited list of foods your child eats, it’s important that you consult with a professional to ensure you are doing it in a safe and effective manner. You want to make sure your child is still consuming a nutritious diet, and that you are making safe supplementations where needed. Take it slow. As tempting as it is to ‘go big or go home’ when you read about alternative autism treatments that promise to help improve your child’s autism symptoms, the gluten free casein free diet is a complete lifestyle change, and should be approached slowly. Read the literature, talk to a dietician, make changes slowly, and come up with an action plan you can sustain over time. Use positive reinforcement. Getting a child with autism to try new foods can be very challenging, and positive reinforcement is a great tool to help encourage your child to continue trying new foods. Reward charts can be very effective, and working with your child to find meaningful rewards for trying new foods can go a long way in helping you reach your goal of transitioning her to a gluten free casein free diet. Get your child involved. Children (and adults!) like to have control over their lives, and getting your child involved in grocery shopping and meal preparation, and allowing her to plan her meals will go a long way in giving her more perceived control over what she does/doesn’t eat. Use distractions. If your child is struggling with the changes you’re making to her diet, consider using distractions like the TV, iPad, and any other toys that might help. While this isn’t a good long-term strategy, it can make all the difference in keeping kids calm during periods of transition. This is a great guide to help you get your feet wet with the gluten free casein free diet and make lifelong changes. From explaining how the foods our children eat can impact their brains and bodies, to providing tips to help overcome sensory sensitivities and picky eating, this book also includes 75 recipes your children will love. With easy-to-follow meal plans, ingredient lists, and delicious recipes, this book is a great starting point for parents who want to transition their child to the GFCF diet. This book is filled with tips on adopting the GFCF diet and how to deal with picky eaters, and also includes food substitution ideas as well as over 100 kid-friendly GFCF recipes! Finding GFCF recipes your child will actually eat can seem challenging, especially if picky eating is already a struggle in your household. Fortunately, there are tons of parents who have already done the hard work, and thanks to the wonderful world of Pinterest, there are so many kid-approved GFCF recipes at your fingertips. Here are some of our favorites! Little research has been conducted on the effectiveness of a gluten free casein free diet as an alternative treatment for autism, but since some parents and caregivers report an improvement in autism symptoms after removing gluten and casein from their child’s diet, it’s definitely an option to consider. Remember to speak with a trained medical practitioner and/or a registered dietician before making any changes to your child’s diet to ensure it’s safe and she’s getting the nutrients she needs, and be sure to take thing slow, get your child involved, find ways to keep her motivated, and check out the list of kid-approved GFCF recipes we’ve included in this post to help appeal to her taste buds. If you found this post about the gluten free casein free diet helpful, and enjoyed our favorite GFCF recipes, please share this post on Pinterest! And if you’re looking for more information about autism, please follow our Autism and SPD board, where we share all kinds of great ideas we find each day!